Educational Institutions: Illinois College (private, four year liberal arts college of approximately 1,000 students); MacMurray College (private, four year liberal arts college of approximately 550 students); Illinois School for the Deaf; Illinois School for the Visually Impaired. 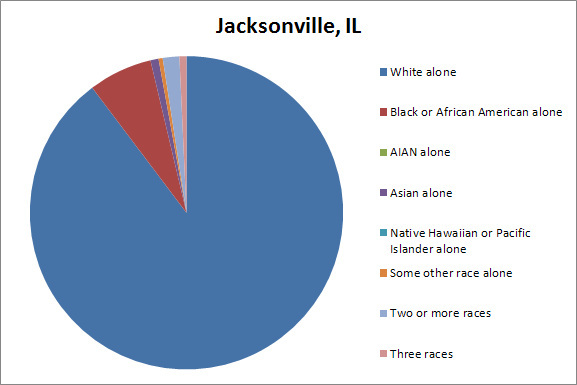 Jacksonville is predominantly white, with a proportionally higher number of people in their early 20s and in their mid-40s to 50s. 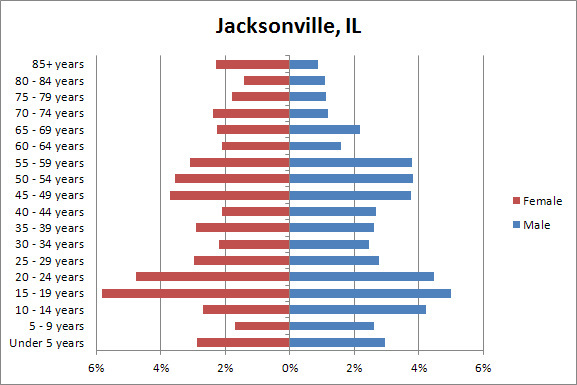 These populations have markedly different household incomes; students at the undergraduate colleges tend to have lower incomes while the population of older adults likely accounts for Jacksonville’s wealthier residents. 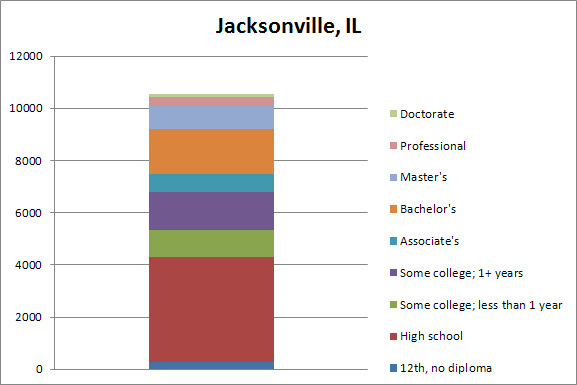 Jacksonville is a regional employment center; nearly 40 percent of Morgan County residents work in Jacksonville but live elsewhere. 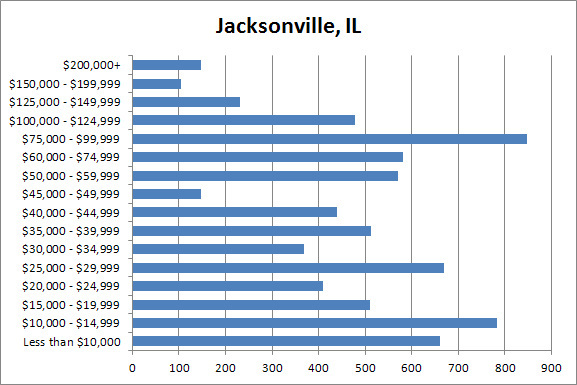 The largest employers in Jacksonville are the Passavant Area Hospital (925 employees), Pactiv (800 employees), Perma-Bound (500 employees), Jacksonville Correctional Facility (490 employees) and Jacksonville Developmental Center (450 employees). Subsidiary industries located in Jacksonville, such as Blue Cross Blue Shield with 300 employees, also provide major sources of employment (JREDC, 2009). Innovative business leaders: Two business leaders in the Jacksonville community have paved the way for much of its downtown revitalization by investing in their own businesses; between them, these business leaders own four establishments in the downtown. Mark Shierl owns and operates three restaurants – Mugsy’s, The Brick House and Mulligans – and Joe Racey owns the Three Legged Dog Café (Tighe, 2011). Institutions: Though Jacksonville has only 20,000 residents, it is home to two private liberal arts colleges and four state-run institutions – the School for the Visually Impaired, the School for the Deaf, Jacksonville Correctional Facility and the Jacksonville Developmental Center. These institutions represent a ‘pull’ factor for Jacksonville by providing jobs and needed social services for a regional market. Regional development coordination: Jacksonville’s successful revitalization has been largely attributed to a collaboration between several for-profit and non-profit organizations, including the City of Jacksonville, Jacksonville Area Chamber of Commerce, Jacksonville Area Conventions and Visitors Bureau, Jacksonville Regional Economic Development Corporation, Imagine Foundation, Morgan County, Illinois Main Street, Illinois Historic Preservation Agency, Landmarks Illinois, National Main Street, and the National Trust for Historic Preservation. Jacksonville’s collaborative efforts have been so successful that in 2012 it was named a Great American Main Street by the National Main Street program (Jacksonville Main Street, 2012). Historic preservation initiatives: Jacksonville is a Certified Local Government which makes it qualified for state and federal funding to renovate and preserve historically significant buildings. According to Jacksonville City Clerk Skip Bradshaw, one project was funded using a $580,000 loan to be repaid over the decade using TIF funds and an additional $3.2 million in federal funding which was received and secured through contact with state representative and senators (Bradshaw, 2011). Bradshaw suggested that the community successfully secured funding because it had “shovel-ready” projects that were ready to go when funding arrived. Jacksonville also has many financial incentives that underpin this initiative, including historic tax credits, ADA compliance credits, federal rehabilitation investment tax credits, and easements. The Jacksonville Enterprise Zone Development Corporation Loan Program specifies that incentive funds must conform to the Standards for Rehabilitation and the Main Street Design Guidelines (Jacksonville Main Street, 2011). The arts: Jacksonville has hosted the Walldogs, an artist collective that paints murals to help beautify cities; more than a dozen murals were painted in Jacksonville through an artist-in-residence grant. Additionally, Jacksonville Regional Economic Development Corporation is exploring the possibility of installing an arts incubator in the downtown (Tighe, 2011). Zoning: Jacksonville’s downtown area is predominantly zoned as B-1 (neighborhood business district) and B-2 (central business district), which allow upper-floor and rear residential uses with special permits. Jacksonville uses design guidelines to enforce aesthetically pleasing buildings by enforcing elements such as percentage of glass on ground floor facades, appropriate materials for rehabilitation, and prohibition of blocked or screened windows (City of Jacksonville, 2012).